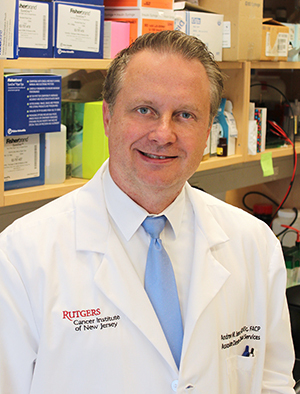 New Brunswick, N.J. - Systems biology analyses conducted by Rutgers Cancer Institute of New Jersey researchers and colleagues examining drug resistance to a common antibody therapy for non-Hodgkin lymphoma suggest calcium signaling may have an influence in addressing this treatment obstacle. Results of the work are being presented at the American Society of Hematology Annual Meeting in San Diego this week by senior investigator Andrew M. Evens, DO, MSc, FACP, associate director for clinical services and director of the Lymphoma Program at Rutgers Cancer Institute. Dr. Evens, who is also the medical director of oncology services at RWJBarnabas Health, shares more about the work. A: The CD20 protein found on the surface of mature B cells is involved in the regulation of B cell differentiation and is a well-established target for anti-CD20 therapy in the treatment of B cell malignancies. Drug resistance to these antibodies, including rituximab and obinutuzumab, remains an ongoing challenge in the treatment of non-Hodgkin lymphoma. Many patients will become resistant to these commonly used antibodies. However, the mechanisms responsible for this resistance are unclear. It was our aim to define the immune-biological landscape surrounding this resistance. Q: Tell us about the work and what you and your colleagues found. A: We conducted systems biology analyses and immune functional studies with rituximab resistant and obinutuzumab resistant cell lines in non-Hodgkin lymphoma models and found that these cells were associated with downregulation of immune signaling pathways, cytokine hyposecretion and upregulation of B cell receptor signaling. Observed biological changes indicated that loss of CD20 associated with decreased calcium signaling could be a master regulator of anti-CD20 resistance. With that, we further used depolarizing and hyperpolarizing agents to both restore favorable signaling changes associated with anti-CD20 antibody sensitivity as well as mimic a resistant phenotype in sensitive cells. Q: Why are these results significant? A: This tells us that calcium likely plays a role as a master regulator in anti-CD20 resistance and could serve as a target for the treatment of anti-CD20 resistant non-Hodgkin lymphoma. Future studies should focus on this novel mechanism. Aside from Evens, other authors on the work are Ravi Dashnamoorthy, PhD, Rutgers Cancer Institute; Afshin Beheshti, PhD, Wyle Labs, NASA Ames Research Center, Mountain View, CA; Saheli Sarkar, PhD and Tali Konry, PhD, Northeastern University, Boston, MA; and Michael Levin, PhD, Tufts University, Medford, MA. Author disclosures and other details can be found here: (https://ash.confex.com/ash/2018/webprogram/Paper118787.html). In addition to this work, there are some 30 abstracts, posters and oral presentations from Rutgers Cancer Institute faculty that are being presented at this year’s annual meeting.